However, when I have been cooking at home, it's been simple and easy (but relatively healthy) dishes like the one I am about to share with you! The Super Scramble is one of the quickest and most filling meals I know. The ingredients sometimes change, but the general idea is the same. Start by cooking some chopped onions and garlic in olive oil. Add some Great Northern beans to the mix. What's the difference between a Great Northern bean versus a Cannellini bean versus a Navy bean? Check out this great article on CookThink to learn all about your legumes! Really I love all legumes but the Great Northerns were on sale. And who can resist a fiber filled savings? Add some chili powder, fresh ground pepper, and a sprinkle of salt to the mix. Reduce the heat and add some eggs or egg whites. I like to include a whole egg because of all of the fabulous nutrients the yolks have. Scramble the eggs into the mix and cook, but don't wait too long to do the next part or you will overcook your egg. The next step is to cover the entire pan with fresh spinach. You can buy bags of organic spinach for a relatively low price usually. I love how the heat steams the spinach. As it begins to wilt, mix it into the scramble. Once your spinach has wilted, spoon the scramble into a couple of bowls. Serve with cheese melted over the top if you want. It is easy, delicious, chock full of nutrients, and it reheats well. The nutritional data will change based on the ingredients and amounts you use but trust me when I say you get a lot of bang for your caloric buck. Enjoy! Your Super Scramble sounds like just the thing for a vegetarian like me. Thanks for sharing. I think I'll try it tonight. never thought to add beans to my eggs- interesting! Thanks! carol that image is perfectioN! I like the sound of them eggs and might actually attempt my version this weekend.! YUM! A perfect easy and delicious meal! My husband adds beans to his eggs all the time and I just never really thought of doing that... 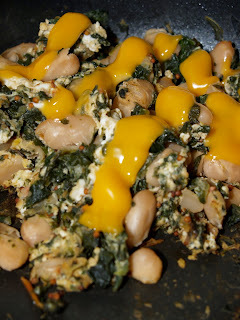 I make a similar egg scramble but never with beans. I've never though to add beans to my omelet but this looks and sounds fantastic!